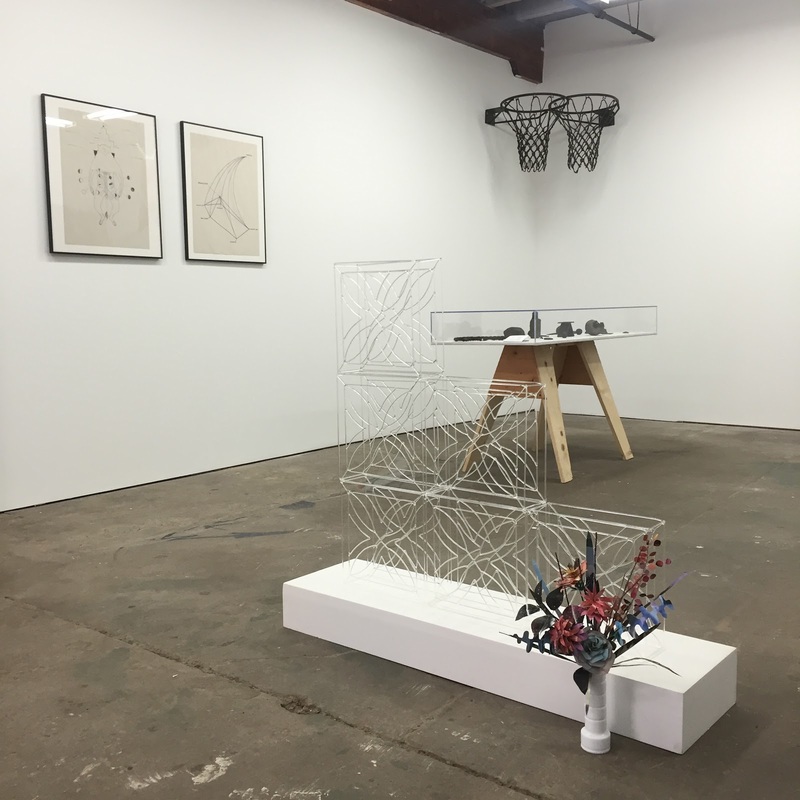 Mixed-media artist Kristen Neville’s spring 2016 thesis show at Tyler School of Art was a panoply of material forms, textual ruminations, and object compositions exploring nature futures and histories, metaphysics, and quotidian matter in a completely unique and exciting way. 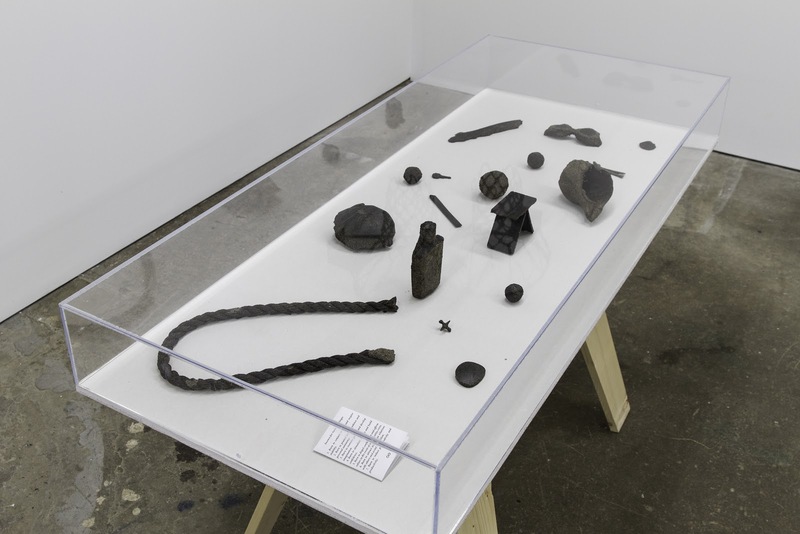 Neville’s deft material transformation coupled with a sort of curatorial object poetry made a searing impression, inviting viewers to consider the potency of the everyday alchemy that defines our material lives and the objects that surround us, and begging questions about our planet’s future in the face of rapid consumption, globalized trade, corporate land use, and estrangement from traditional knowledge(s). I made a point to catch her work in subsequent shows, and each time was met with material and technical surprises: the use of electronics and motors, protean materials like incense and plants, a strong presence of drawing, and always, wild and new feats in glass manipulation. The evident experimentation, risk, and maker-wisdom present in each project and work left me brimming with questions for the artist. I was lucky enough to catch up with Kristen in her studio this fall to discuss her latest projects, her history and influences, and her relationship with Philadelphia and the present moment. Kaitlin Pomerantz: I first got to see a critical mass of your work at your thesis exhibition at Tyler School of Art last spring. I was blown away by its simultaneous humor and gravitas, by the material play but also command. I’ve been grateful that there have been many opportunities to interact with your work since then, and was able to check out your stunning two-person show with Hannah Doerksen at Pilot Projects, and then most recently your strong contribution to the group show Costumes, Reverence and Form at Vox. Can you describe some of what you’ve been working on, and your experience, since finishing graduate school? Kristin Neville Taylor: It’s been a continuum as I have been fortunate to have a few projects out of the gate to keep me moving through ideas and generating work. Much of the work I have completed since graduation is a manifestation of things I was working on in school. In June I showed with Hannah Doerksen at Pilot Projects and was able to revisit ideas dealing with character development, and the development of a character through a series of sculptures and drawings. Then I took a course at Pilchuck Glass School learning 3D modeling and printing with an emphasis on glass casting. Upon returning I helped install the Middle of Nowhere exhibition I co-curated with David Kessler in the Pine Barrens. I then found a studio in Strawberry Mansion directly behind John Coltrane’s house which is an amazing commute along the river from my house, and was finally able to settle in this fall while making work for Costumes, Reverence and Forms. KP: Would you mind unpacking one or any of these experiences a bit? KNT: Joining David Kessler as artist and co-curator of Middle of Nowhere was exciting, as it became a chance for me to think about curating and making in terms of a place very different from Philadelphia. I had first been to the Pine Barrens in 2015 with David Kessler and Allen Crawford (who has an active role in the film), in preparation for the exhibition I curated at the Esther Klein Gallery called A Usable Earth. I remembered Allen saying that after the industrial revolution, the Pine Barrens looked like the surface of the moon. All the trees had been cut down to use for fuel and when they were gone, the glass and iron industries vacated the premises. The image of the landscape once looking like the moon stuck with me. In John McPhee’s The Pine Barrens, he cites many instances where different parties prospected the land in the Pine Barrens, proposing developments such as an “International Jetport” and a megalopolis. Joseph Wharton (founder of Wharton Business School), purchased what is now the Wharton State Forest because he wanted to take all of the water and sell it to Philadelphia. By way of a miracle, this never happened, and it later became a state forest. With the work I made for the show, I wanted to connect land claims made in the Pine Barrens with extraterrestrial land claims (or, claims to the moon). At first I was doing these pounce drawings of images from the architectural renderings that people had proposed for the Pine Barrens because I liked the idea of tracing over the landscape. As I was doing this I kept holding them up to see if I had broken through and I discovered that I really liked the effect of the light coming through the paper, which took on the appearance of a lightbright or a cosmos, more than the stenciled image. KP: Hearing about this project and the multivalent work that emerged from it engages one of my key questions about your practice, which is about your facility with different kinds of materials. Where do you get this material sense and how have you cultivated that? I then took a summer drawing class at Moore School of Art, where I met artist Martha Savery. One day she told me to follow her after class. We walked from Moore to 2nd and Strawberry in Old City, to Hot Soup — this public access glass studio — where she worked. I ended up getting an internship there. Martha and I parted ways, but would later come back together to start Little Berlin. She got me into that world, got me hooked. Because of that, when it came time for college, I wanted to go somewhere affordable, with access to glass, which is why I chose Tyler. Glass was my intro to many other materials, I got sort of hypnotized, but at some point I realized, wait, this can’t really serve all my ideas. So then I had to push back and look for other things. Materials have moods and histories, and because of my familiarity with glass, I was able to understand that glass has a unique position in that its life as an art material is often distinct from its social life. Because of this knowledge, I am often trying to reconcile the social life of a material with its role in an art object/image. KP: In terms of your creative process, do you tend have ideas and the material is there with the idea? Or are you starting with materials? KNT: It depends on the project. Often I don’t understand how new materials function until I begin working with them. In general, for me, the conceptual and the material need to run alongside one another. And I think it’s important to sometimes not know all the answers, until experiencing working with material. For example, with the pounce drawing, I had a hunch, and tried it out, and gained a better understanding of it its potential just from having done it. I don’t think it ended up working in that context, but now I have that as a tool for a future project. Often I just have to start, in order to see how it will work, even if it doesn’t end up making any sense for the thing I think it will. KP: It’s so interesting to hear about how you were able to form all these acquaintances and have all these experiences and accrue this whole body of knowledge, all here in Philadelphia. Could you talk a little bit about your relationship to here? KNT: I always thought I’d leave. I came really close to moving to California for graduate school, but had to call it off due to extenuating circumstances. Even though there is a judgement that sometimes comes along with never leaving, I’ve learned to pride myself in making the best of my situation. There is so much that’s been great about just being here: resources, support from family, friends, peers, institutions. We’ve built a life here, basically built a house here. I think it was hard to recognize how I was situated in Philadelphia because it is the only place I’ve ever lived. More recently, I’m trying to understand what that means. KP: Do you feel responsibility toward this city, as this is your home and the place that created you? Do you feel that your work is directly in dialogue with here? KNT: I think that the part of my work that is Philadelphia is more… innate. I feel like when I’m influenced by family that’s when it’s very local for me, because there’s this Philadelphia culture or localism that is very specific. I think sometimes I can see when it comes out, sometimes it’s more apparent, other times I think it’s just a tone. But actually in my [graduate] thesis I was actively connecting Philadelphia to the past by way of Benjamin Franklin’s Farmer’s Almanac and its relationship to Hesiod’s Works & Days. Almanacs contain long-range weather forecasts, aphorisms and advice for the farmer and amateur gardener alike. Following this structure allowed me flexibility to move across media and to think critically about climate, the advent of agriculture and the industrial revolution in terms of history and place. And with other work, I’ve thought about my neighborhood Powelton and its former role as an enclave for different movements including early environmental activism. 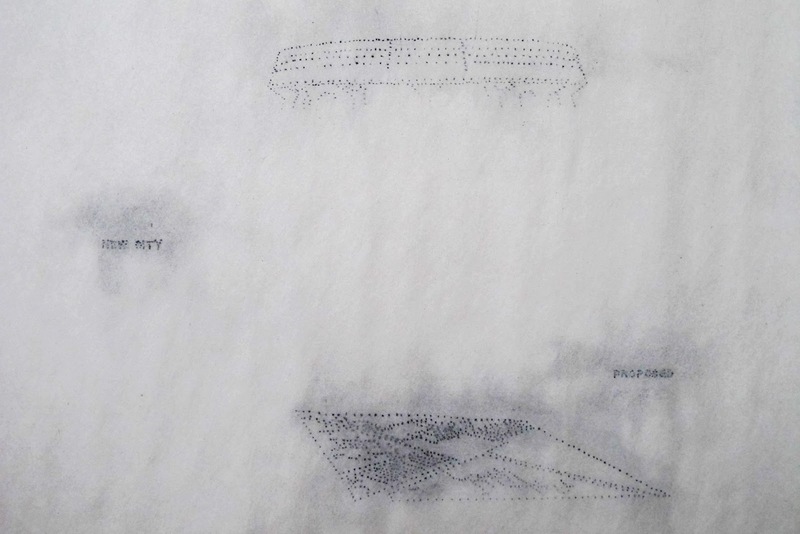 In a group show at Vox in 2014, I showed a group of works that referenced a family copy of The Whole Earth Catalogue in order to speak about the complexities of inheritance, place, and environmentalism. For example, in Do Something Wrong Today: the woman in the photo is my mother-in-law looking backwards. My in-laws moved to Powelton in the 60’s and have lived here ever since. I wanted to create something that embodied a nostalgia for that time. KP: Do you feel that the landscape of this city — its materiality, nature, built space, its age — impacts your work? KNT: Yes, I think in the way that time is evident in the built space with the contrast of the old to the new, the ways that historic landmarks are literally labeled, and as a teenager growing up here the way that we’d designate outdoor spots like “the view” above the Rock Garden on Kelly Drive, or “the ducks” on West River Drive. And the trash, the things people consume — follows you everywhere. I just returned from a residency in Vermont and I realized some of my ongoing projects really rely on trash. I have a collection of broken glass still stuck to the labels and small objects that I shape into spears, but there was no trash there so I couldn’t work on these things in my down time. I love the big gulp cups in contrast to a white walled space. I like to see some of that looseness and immediacy, the record of the streets in contrast to the gallery space. KP: Yes, something so striking is that you’re working with these fragile, in some way precious materials, but they don’t come off as precious. 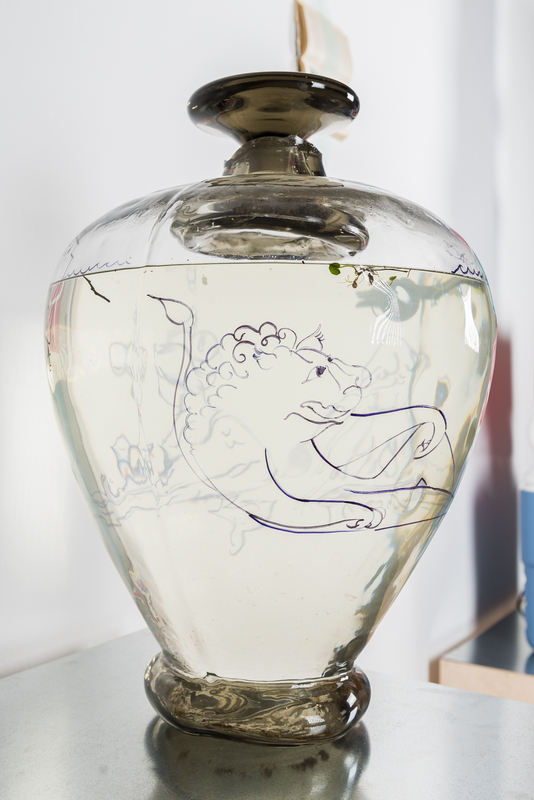 For example, here, where you’ve drawn with Sharpie on this incredible glass urn. Is this fragility/looseness an intentional balance? KNT: I think so. 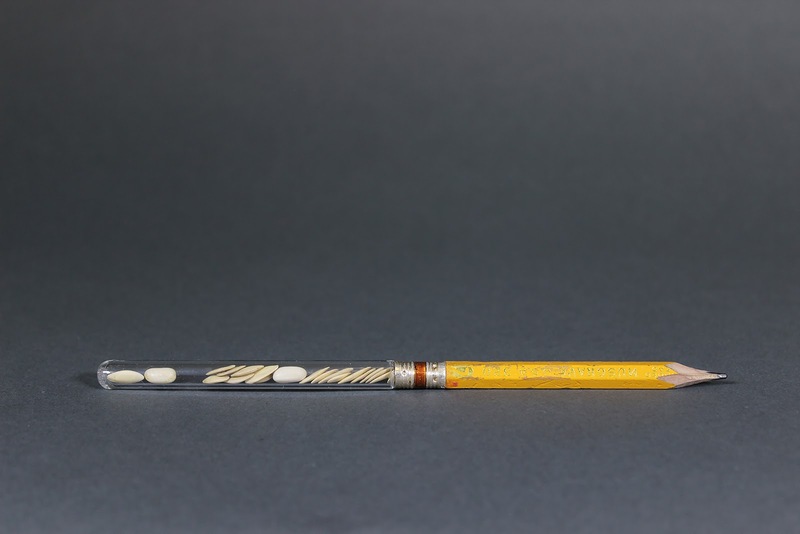 In this instance I preferred the flexibility of the marker which can be removed, changing the story as opposed to if the glass were etched or engraved. When I make something that’s more permanent, it challenges me a bit to take care, in considering its longevity, how its meaning will change over time. Having access to both refined and crude media allows me a bigger range to tune into an idea. KP: I think of you as a sculptor, but at the same time, so much of the work you make is almost kinetic or even time-based, in the sense that your work is often poised for material transformation. I’m thinking of the incense pieces at Pilot projects. You are making these materially-static objects that are on the verge of dispersion, or becoming something else. KNT: What I really like about incense is that an incense maker can project an experience onto it for the user. “Burn this for love,” this kind of idea is what first drew me to it. I liked thinking about the way that we assign meaning to the objects that we surround ourselves with. 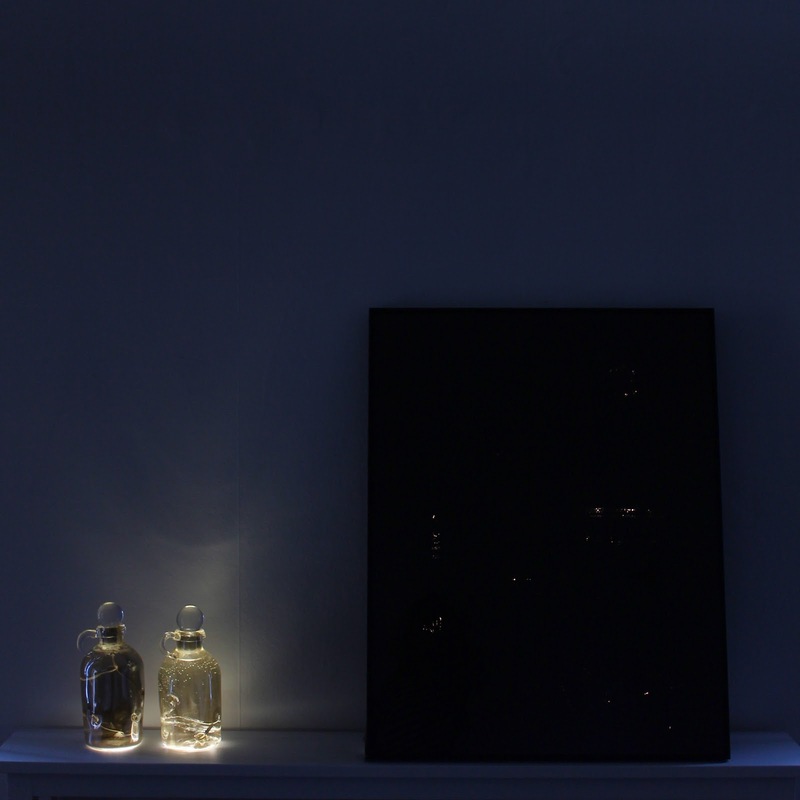 A project of mine in the past year or so is trying to detach from privileging objects. It was a way of saying this has meaning, but now I’m going to burn it, destroy it, in a way. 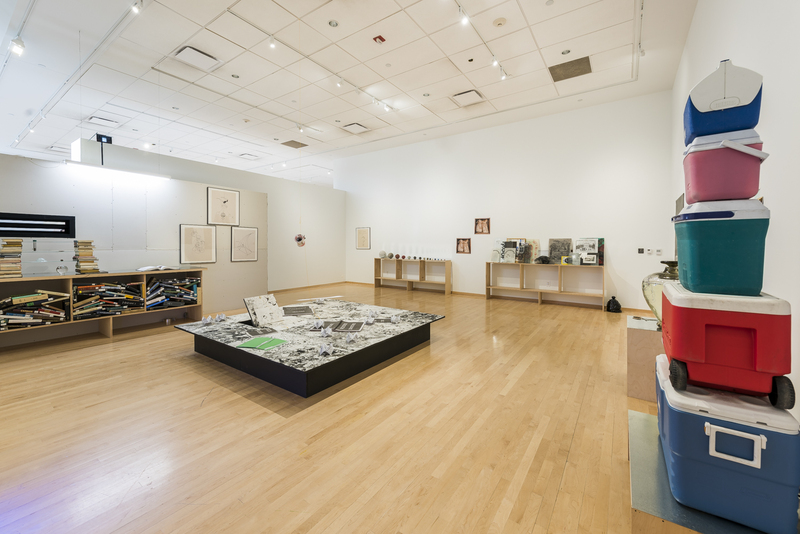 KP: What was behind the impulse to detach from privileging objects? KNT: I think because I tend to do that, privilege objects. I’ve always been drawn to the items individuals collect, and material culture in museums. I was interested in why and then questioning that as a practice. I began to research objecthood and the writing around thing theory. I am super excited by Severin Fowles research and approach to speaking about things. 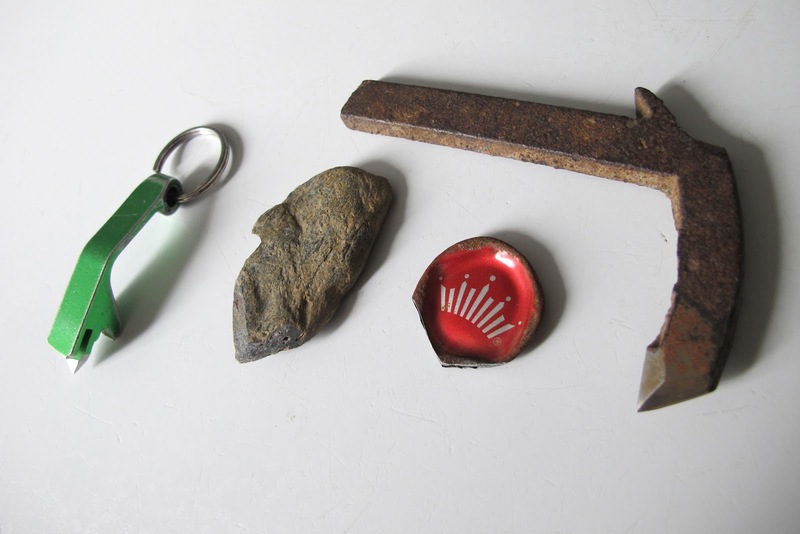 He has a typical archeology professor’s office with artifacts collected from different parts of the world, which he calls “cruel reminders.” The momentum around objects and object theory prompted me to consider absence. If we aren’t focused on objects or the material things that are left behind, what is there? Like imagining a museum without stuff. What does that look like? Moon, weather, emotions, ha. KP: Your work also often includes plants, living matter, another contrast to the static materiality of something like glass. Could you speak to your use of living matter as material? KNT: I remember in undergrad I ordered flies from a company for a project, but when they came I realized they couldn’t fly — they had been genetically modified to not fly to be easier food for lizards or frogs. I recall later making tiny wings for them that looked like early Wright brother’s planes. But more recently I think that living matter, and in particular plants, is related to a more conscious effort to make all parts of my life enmeshed. I’ve always owned plants and as a homeowner I have a roof garden which I’ve had the privilege of tending to for the past 9 years this spring. Gardening is an important aspect of both my mother and mother-in-law’s lives and it has become a very important part of mine. I think that when I realized I had made a distinction between my studio practice, the garden, and cooking (for example), I wanted to dissolve these boundaries. For me, plants contain histories and complex narratives the same as other materials I use in my practice such as glass or found objects. KP: Could you describe where you see yourself within the space of environmentally-engaged art? Within the vast spectrum of artists who have engaged landscape and land use, from land art to eco-art to environmentally-remediating design to more ancient or indigenous site-specific work, your work seems to occupy a unique and particular — hard to name, even — place. KNT: Sure, I have for a long time been committed to understanding the factors that influence perceptions of nature, from early curatorial projects to more recent artworks. It’s definitely different than eco art that might try to influence an audience’s opinion or advocate for a particular issue. I am trying to record stories of the environment from the past and present as they operate in a contemporary context. It has to do with questioning my own understanding of truth. KP: Do you feel like the work helps you connect to things you are trying to understand? KNT: Yes, definitely making work for me is making sense of ideas I often don’t understand even after I’ve made the work. And I think it speaks to our particular timeframe, of ideas being too large or difficult to grasp, the need to think in terms of different timescales and perspectives. Art, like fiction or poetry, is a space where this can happen quite easily. KP: There is something quasi-scientific about the way that you work, even in terms of materials and form, but it also seems like there’s a sense of humor in your work, regarding science. Do you feel like you are mocking science? KNT: No. I love science. But I don’t want to privilege science over other types of knowledge, either. I like to consider other knowledge forms too, pre-science, pre-modernity, while revering the discipline. But humor is important and is a direct route to a more childlike approach to thinking and making. KP: Despite this humor and childlike approach, your work undeniably gets at serious political concerns, specifically with regards to land use and control of nature. Could you describe a few projects that seem to get at this most directly? KNT: Seed Vault Souvenir is a piece I made in response to the Svalbard Global Seed Vault in Norway. The mission of the seed bank is to protect against the loss of diversity in genebanks in the event of a natural disaster or war, but the value of seeds is not on our radar because it hasn’t directly affected us yet. Recently, Syria made the first “transaction” from the seed bank taking back almost half of their seed samples due to internal strife caused by civil war. I was imagining a time in the future when the value of seeds and seed diversity was more commonplace. Right now, I have work in an exhibition at Rowan [University] called How Food Moves: Edible Logistics, curated by Daniel Tucker. My project is centered on the route oranges travel inspired by a line from the Leonard Cohen song, “Suzanne.” In it he writes: “and she feeds you tea and oranges that come all the way from China,” and it is a line that I have often associated with the market place and the movement of food but also romance and the exotification of other cultures. I’ve installed oranges in the space each outfitted with a QR code sticker in place of its company sticker that links viewers to Nina Simone singing “Suzanne”, recent articles about migrant movements and their effect on the orange economy, poems, and artworks that take oranges as a point of departure. I really like thinking about the collection of links as a “prismatic archive,” a term I learned from Julian Yates who writes about the color orange in relationship to the arrival of the fruit. 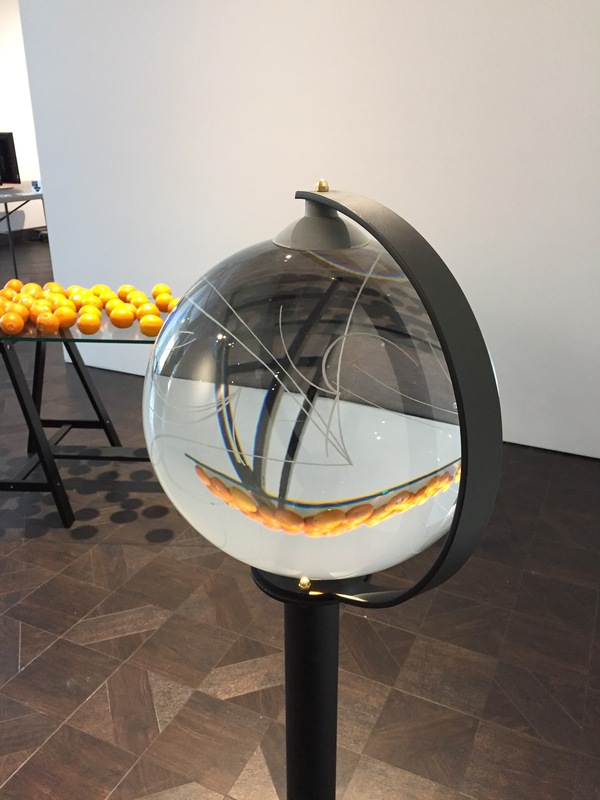 I also made a glass globe that is etched with the paths oranges take around the world that is filled with water so it becomes a lens. KP: Do you feel that your work or role as an artist has changed with this new administration? KNT: I had a studio visit for Costumes, Reverence and Forms two days after the election and I remember it was difficult to see at the time how my work figured into this new reality. It was like everything was still coming into focus. I’ve since realized that some of the concepts that are central to my work such as climate and the environment are heightened by the new administration and, unfortunately, bring them into greater relevance. Beyond this, I am more actively trying to find ways beyond my studio practice to engage with the issues I hold close. Kristen Neville Taylor lives and works in Philadelphia, PA. Her diverse practice combines drawing, sculpture, and glass. 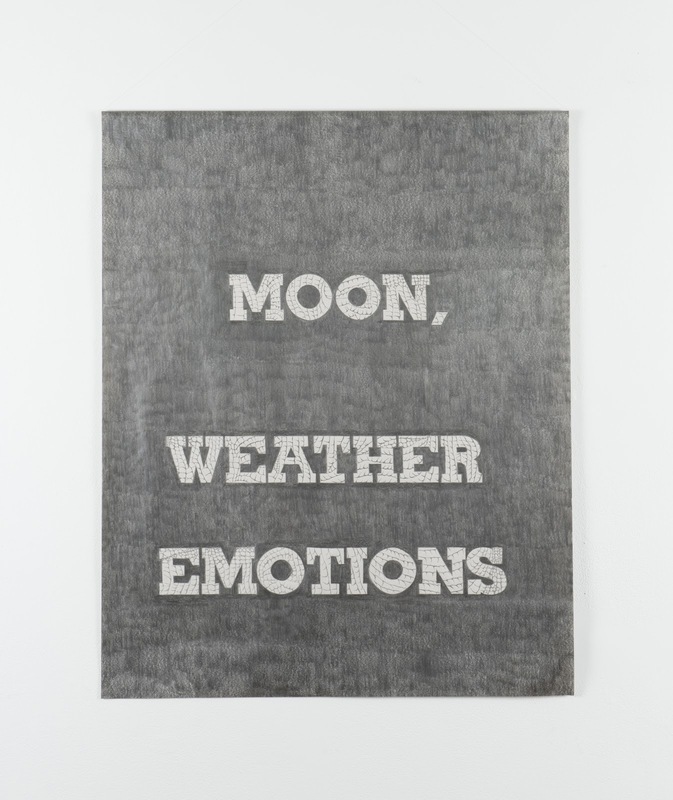 Taylor’s work considers perceptions of nature and culture through science, anthropology, science fiction, mythology, and history, as well as, the moon, weather, and emotions. 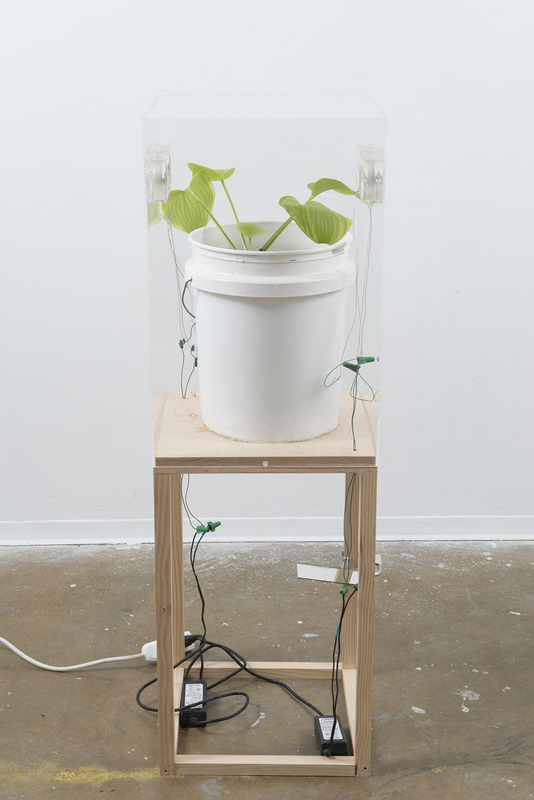 Her practice has been described as alchemical and utilizes pseudo-scientific experimentation to playfully reimagine our relationships to concepts such as the Anthropocene, social and political movements, and Western culture’s fetishizing of objects. Taylor’s work has been shown at Bunker Hull, Little Berlin, and Vox Populi galleries in Philadelphia, Richard Stockton Art Gallery in New Jersey, and as a part of Expo Chicago. As a curator, she has organized several exhibitions including Landscape Techne at Little Berlin, The Usable Earth at the Esther Klein Gallery, and most recently she co-curated Middle of Nowhere in the Pine Barrens. Taylor is the recipient of the Laurie Wagman Prize in Glass, the Jack Malis Scholarship, and a 2017 Vermont Studio Center Fellowship. Taylor will exhibit work in March/April at PNCA in Portland, OR and the Rowan University Art Gallery in Glassboro, NJ. In April, Taylor will begin a 3 month residency at Wheaton Arts and Cultural Center in Millville, NJ. 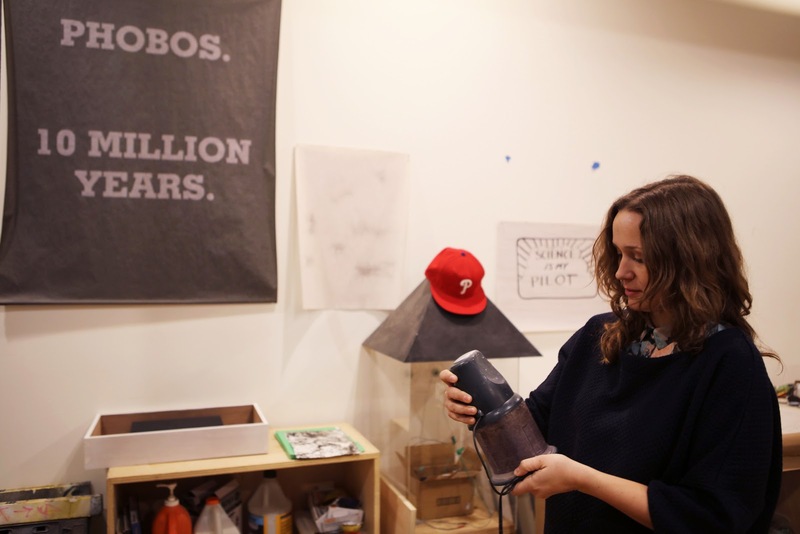 Kaitlin Pomerantz is an artist and educator in Philadelphia, and an editor at Title Magazine.